Team India managed to avoid the whitewash and win the last Test of the series by 63 runs, despite Hashim Amla and Dean Elgar’s fighting partnership, thanks to an exceptional bowling performance from their pace bowlers. Mohammed Shami took five wickets to make the series 2-1. Brief scores : India 187 (Virat Kohli 54, Cheteshwar Pujara 50; Kagiso Rabada 3/39, Andile Phehlukwayo 2/25) & 247 (Ajinkya Rahane 48, Virat Kohli 41; Morne Morkel 3/47, Vernon Philander 3/61) beat South Africa 194 (Hashim Amla 61, Vernon Philander 35; Jasprit Bumrah 5/54; Bhuvneshwar Kumar 3/44) & 177 ( Dean Elgar 86*, Hashim Amla 52; Mohammed Shami 5/28) by 63 runs. 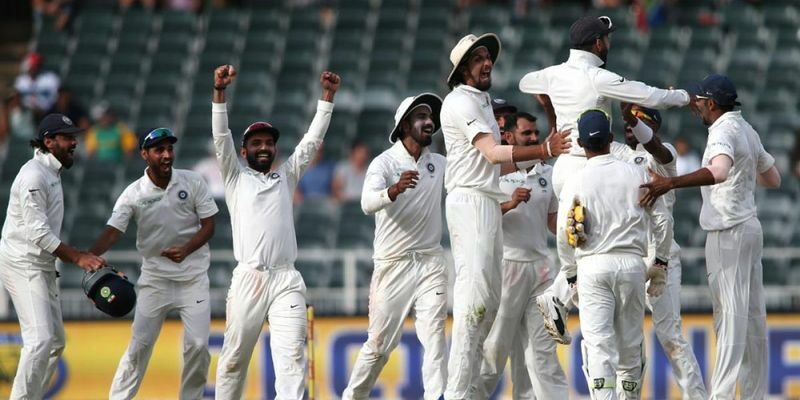 After losing the first two tests of the three-match Test series, India wanted to show their fighting spirit to avoid the whitewash but it wasn’t a good start for the team after deciding to bat first on the Wanderers track. The visitors faced an initial setback as both their openers returned to the pavilion with the scorecard reading only 13 runs. It was Cheteshwar Pujara and Indian skipper Virat Kohli who built a much-needed partnership to take the Indian team to a respectable score. Both players produced half-centuries and Bhuvneshwar Kumar contributed with 30 runs down the order to help India post a total of 187 runs. Kagiso Rabada led the attack for South Africa as he grabbed three wickets in India’s first innings. South Africa ended Day 1 on 6 for 1 as they lost Aiden Markram on Bhuvneshwar’s delivery. Bowlers put India right back! It wasn’t a good start for the host as well as they lost their second opener when their score was only 16 runs. However, Hashim Amla stood tall in front of some deadly fast bowling and played a 61-run knock, which was the highest score from any South African player in the first innings. Apart from Amla, Rabada and Vernon Philander also made an important contribution of 30 and 35 runs which helped the side post 194 runs. The Indian pacers again proved their worth in the seamer-friendly conditions as Bhuvneshwar claimed three wickets and Jasprit Bumrah returned with 5/54, while Ishant Sharma and Mohammed Shami claimed one each. India started their second innings on the second day itself with Murali Vijay and Parthiv Patel opening the batting for India and as the team ended the day with 49 after losing the wicket of Parthiv Patel. India resumed the third day on 49 for 1 and had to face Vernon Philander’s relentless swing which was sufficient for KL Rahul to edge it to du Plessis. Three overs later, Morne Morkel’s bouncer took an edge off Cheteshwar Pujara’s bat and suddenly a comfortable 51 for 1 had become 57 for 3. Vijay and Kohli got together for one of the most defining passages of the day and steered India to 100 before Vijay was castled by Rabada just before the lunch break. Post lunch, Kohli joined hands with Rahane to pull India out of the woods. The latter was especially impressive as he timed the ball crisply. After Kohli’s dismissal, Rahane and Bhuvneshwar proceeded to put on the highest stand of the innings, adding 55 in just 14.2 overs. Shami showed some pyrotechnics in the lower-down order and helped the team reach a total of 247 runs, giving the hosts a 241-run target. However, it was not the biggest news that came out from Wanderers that day as pitch took center-stage and the umpires had to call an early end to the day when Dean Elgar was hit on the grill of the helmet which summed the inconsistent bounce on the wicket. South Africa needed 223 runs more to win the series 3-0 and whitewash the top Test team in the world. Elgar and Amla took charge and ensured that South Africa didn’t lose their wicket on a less spiteful pitch, which was moderated after using a heavy roller at the start of the day on the orders of the match referee. Elgar and Amla helped SA reduce the deficit to under 100 and looked to be taking the game away from India. Ishant got India the much-needed breakthrough as he managed to take Amla’s wicket when South Africa’s score was 124. For the visitors, it was only Elgar who managed to hold the strike from one end, but he didn’t find any support from any of his other teammates. The Indian bowlers utilized the bounce, or the lack of it, on day four to send back 4 South African players on ducks. Shami was the star of the day as he managed to bag five wickets and helped India wrap the Rainbow nation’s innings at 177.